A recent McKinsey Global Survey revealed that marketers see clear value in social media when it comes to driving customer engagement, but they feel they are ill-equipped to transform insights into action because they do not have sufficient familiarity with skills such as data analytics. In the past 2 years, 56% of marketers surveyed felt they were better able to use digital channels to deliver mutual value to customers and their own brands. For example, marketers are increasingly using Facebook as an online commerce platform, where customers can seek opinions from the brand or their peers before purchasing products from within Facebook itself. Many companies are also harnessing Twitter for customer service – Best Buy’s Twelpforce being a great example. However, less than a quarter of those surveyed are using analytical tools to refine their decision-making processes, even though 39% have increased access to data and insights. This reflects an important imbalance: while companies believe that social media are valuable to their brands, their ability to use analytics to better understand their ‘digital customers’ is hindering their ability to use online channels as effectively as they’d like. 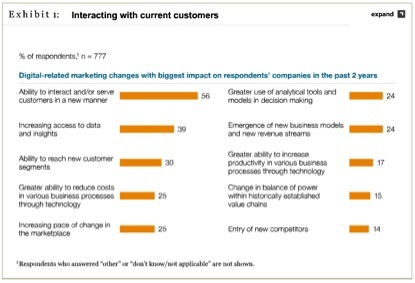 Reassuringly, McKinsey found that there would be a clear shift in focus towards digital tools over the next few years. Interestingly, there will be a diminishing focus on company websites and email as brands invest more in social media. 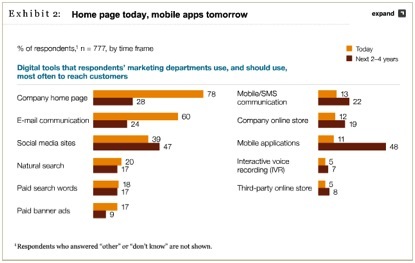 47% of the marketers McKinsey surveyed plan to use social media sites in future, compared to the 39% that currently do. Their greatest interest currently lies in mobile applications, with 48% of marketers planning to engage customers via mobile apps, compared to the 11% who are already doing so. 32% of marketers agree that being able to generate and leverage deep customer insights is central to effective marketing, but they also say that this poses the greatest challenge to them. Interestingly, 11% of marketers stated that they face difficulty in assessing the effectiveness of their digital marketing because of the difference between traditional and online metrics. However, given the vast array of available data about online marketing, and the opportunities to customise tools to report the metrics that matter most to individual marketers, our sense is that this may be more an issue of awareness and comfort levels with the tools than it is one of actual potential. Widely available tools like Google Analytics provide an incredible wealth of data, and can also include enlightening social tracking, but many marketers are yet to get actively involved in the set-up and analysis of the tracking these tools offer. Similarly, Facebook’s free Insights offering provides valuable details of the demographics and location of a Facebook Page’s ‘fans’ – data which marketers can use to identify key cultural trends within their audience, or identify areas for growth that can inspire highly targeted communications activity. The good news is that, although only 14% of respondents have implemented concrete plans to address ‘the data challenge’, almost half are developing, or are in the process of implementing, steps to generate customer insights from online data. Understandably, 22% of those surveyed find managing brand reputation online a challenge, largely because of the open nature of social media. Besides the 19% who already have social media policies in place, a further 38% of marketers surveyed are developing or implementing social media guidelines. Marketers are struggling to assess the impact of digital marketing because of their inability to translate analytic results into insight, or identify the right metrics in the first place. 31% of marketers feel that online metrics do not adequately quantify the financial impact digital marketing has generated for their companies. 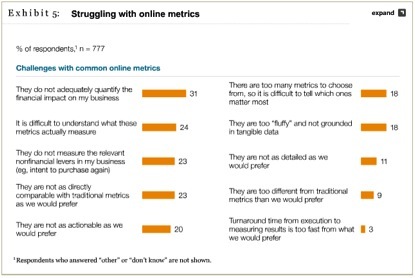 Alarmingly, 24% can’t even understand what these metrics actually measure. 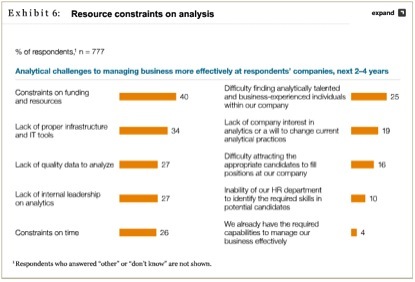 27% of respondents said they feel that they lack internal leadership on analytics. Meanwhile, one-quarter face difficulty in finding internal talent, and one in ten thinks that their HR department is ill-equipped to identify candidates with analytic skills. The greatest challenge, unsurprisingly, lies in funding. 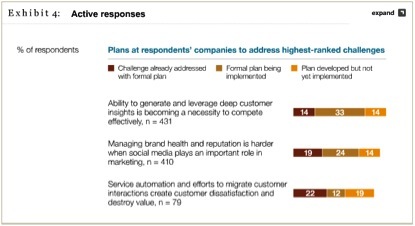 As a result of all these issues, only 4% of McKinsey’s respondents believe that they possess the necessary capabilities to effectively manage their business. 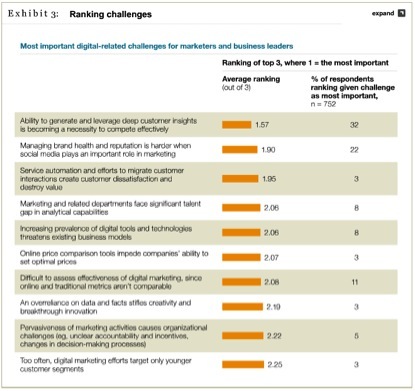 Our interpretation of these findings is that there is a degree of the tail wagging the dog though; digital and social media provide a variety of tools that can help to deliver greater value to a business, and are not merely obstacles that marketers need to try to ‘get around’. Metrics should be at the service of the marketer, helping to measure return on investment, and identifying ways to improve the business approach. Our assessment is that, too often, measurement is an after-thought, and too few companies are setting clear objectives for their digital or social media activities before they get involved in execution. Just as the Industrial Revolution turned into an Industrial Evolution that lasted hundreds of years, so will it take time for present-day companies to adapt to and master this ‘Digital Revolution’. This is an on-going process, and it will take time to effectively fuse digital approaches and technologies into all business functions. In their analysis of the findings, McKinsey reassures marketers that “there’s no single solution” for companies struggling to define their online business model, but they highlight the importance of making use of data rather than merely collecting it. They also suggest that many marketers may be expecting too much of themselves, and too soon. The world of digital and social media is changing rapidly, and it’s unrealistic for any one person or team to understand everything. Consequently, marketers should not be afraid to reach out to third-party partners who can help with data analysis, insight, and subsequent strategic interpretation.